Since 1997, an emerging maker of knives, Randall’s Adventure and Training, has been designing and creating affordable and no-nonsense field knives that are developed particularly for the use of backpackers, adventurers, law enforcement, special operations community and the military and are used specifically as survival tools. The company is run by full time employees that are trainers and also adventurers and these people have the difficult task of testing and developing products that is intended to work in the outdoors, in the remote areas such as the wilderness and other harsh environments. Randall’s Adventure and Training has a very simple philosophy and it goes like this: if the products do not work in the real environment and world then they will simply refuse to create and build the products as well as stop training and teach how to use these products to students. Randall’s is a company known for building the ESEE knives. These knife series was created and developed with years of tough and logical experiences and these are embedded into every blade. The reason for this is mainly because the products of the company are geared directly from their training. Randall’s Adventure and Training has been the frontrunners of several survival training and expeditions courses in the jungles of Amazon as well as in various countries including Peru and all over the USA. In fact, their courses as well as their survival tools and gear have been featured in many television shows such as Discovery Channel and Travel Channel. Randall knives are also a staple in many survival, adventure and outdoor books, magazines and trade publications. 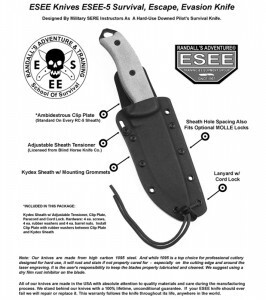 The ESEE Knives from Randall’s Adventure and Training are made in a series. These are the 3, 4, 5 and 6. All of the knives in this series have the same purpose and style wherein the main objective is survival. Among all of the knives, the ESEE 5 is regarded as a beast – surviving machine. Adventurers and outdoor people should have this ‘tool’. The knife has a blade that is about 5.25 inches in length and has the spine thickness of about 0.25 inches, making the ESEE 5 very tough. The blade for this kind of knife is made from 1095 steel that comes with a 57 Rc. Rating. This rating is said to be hard enough in cutting well, but it is still easy to be sharpened if the user is in the field. The handle of this knife is made using the Canvas Micarta that also has the Bow Drill Divot that can be utilized in starting a fire. The overall length of the knife, which includes the handle, is about 10.88 inches. The thickness of the blade makes it nearly impossible for the blade to bend this knife while using it unless you decided to force it. The material of the steel has high carbon content and it is finished using textured powder coat. The width of the blade is measured at 1.56 inches and this gives the ESEE 5 (the OD plain blade model) the necessary power and strength to be used for survival outdoors. The 1095 steel is the most popular material used in the industry of cutlery and knife-making and the 1095, as part of the 10 series has the most amount of carbon giving it better edge holding and is reasonably tough. It is also an affordable material with exceptional quality. This kind of steel has more wear resistance and is great to sharpen. This knife can also come with serrations at the edge in the blade aside from the plain edge. The weight of the knife is 16 ounces making it a good survival tool that users can carry around without having problems in the weight as well as in the length. The handle is made from Canvas Micarta giving users a grip that feels great. It also has enough amount of texture. Many users commented that with excessive use of this knife or long term usage, you could get blisters. You can consider this in buying this knife, but it should not be a deciding factor in buying. The knife also comes with a sheath that is created using the formed Kydex that can hold the ESEE knife in the right place and in very well condition. It also comes with the clip that helps in quickly and easily attaching the knife to the user’s belt. The sheath also features blade tension that is adjustable and this permits users in maximizing the tightness of the blade and how it stays in the sheath, especially for users who are carrying it or planning to carry the knife upside down position. The ESEE knife, particularly the 5 series can be described as full tang kind and solid knife. On the lower portion of the knife, in the handle, there is a tool called “Glass Breaker” that is designed to break glass. Some have said that the knife has the right weight, but there are some who felt that this survival knife is a bit heavy for its size. Nevertheless, it can be a tradeoff for having a solid and well-built knife like this one from Randall’s Adventure and Training. If you plan to use this knife in splitting firewood, you will not encounter any trouble. This feature is largely thanks to the right thickness of the blade assuring users that it will not bend or even break while you use it to split the firewood. One of the pros that users will have in this knife is that the company, Randall’s Adventure and Training, offers lifetime warranty for all of their gears and this says a lot about how they care for their customers and their survival gears such as the ESEE 5 OD Plain Edge. One of the downsides of the 1095 steel is that it rusts easily, hence, the company used a powder coating in order to combat the rusting problem.